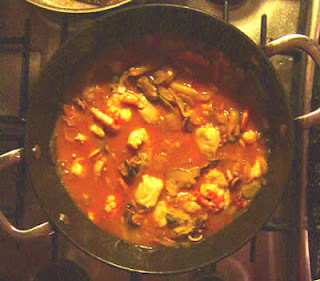 My version of the classic Spanish fish stew. Put wine, sherry and bay leaves in a large pan and bring to boil – add the clams and mussels and cook gently with the lid on for a few minutes until they open (chuck away any that don't open). Remove them from the pan, strain the liguid and put to one side. Gently fry onion and garlic 'til just going transparent (don't brown). Add the tomatoes and cook squishing them about til soft. Add a big pinch of paprika and the chili and continue cooking 'til it's nice and thick. Cut the fish and squid into chunks and dust with the flour then gently fry in a big casserole - start with the firmest fish first - 'til golden. Add pernod and boil off the alcohol or have some fun and set light to it! Add the tomato sauce and the liquid the clams and mussels were cooked in and enough water to just cover the fish (if needed), give it a stir and simmer for 10 - 15 mins. Stir in parsley and season to taste.